This past week was a pretty simple week as far as cooking goes. We only tried two new recipes, and one was a side dish. We did end up having the Basic Crockpot Chili on Tuesday, and it was delicious! Definetly a recipe I will keep. We also tried the Ranch Potato Wedges, and while they were good, they just weren't a huge hit. At our house, it's not just the kids that pose for the camera. For more Wordless Wednesay post visit 5 Minutes for Mom. I made these breadsticks last Saturday night to go with our Chicken Parmesan. I used this recipe from Recipe Zaar. I halved the recipe, and used my bread machine on the dough cycle to mix the dough. The recipe makes an extremely large amount of breadsticks. Cooking DirectionsMix mince parsley, dried basil, salt, black pepper, and bread crumbs in a small bowl.Cut chicken breasts in half. Put egg white in a shallow dish.Dip chicken breasts in egg white, and then dredge through breadcrumb mixture.In a large non-stick skillet fry chicken breasts.Place chicken breasts in a casserole dish, and cover with spaghetti sauce. Sprinkle with Mozerella Cheese.Bake in 350 degree oven for twenty-five to thirty minutes, or cheese is melted.Serve chicken breasts over a bed of spaghetti noodles. I know what you are thinking - who needs a recipe for baked potatoes? I do! When I first started cooking I had to find a recipe for baked potatoes because I had no idea how to make this simplest of meals. I have tried several different baked potatoe variations, and this recipe has won me the most praise. Outside my window...it's gray and cloudy. I am thinking...about how much I love rainy days. I am thankful for...being able to spend such an easy, laid back day with my family yesterday. From the learning rooms....we are getting ready to start a new unit in Biology, and I am considering reintroducing the younger kids to lapbooks. From the kitchen...no cooking today, we are getting to eat out. A real treat for us! Yippee! I am going....to town today to run errands. I am hearing....the voices of my children playing in their playroom. Around the house...there is a lot of housework to do today. The result of yesterday's lazy day. Do you ever cook something, and the whole time you are cooking it you are expecting it to be one of the most delicious dishes that you ever tasted but when you sit down to finally eat it, the meal just kind of tastes flat? That is exactly how I have felt this past week. I had some outstanding recipes picked out, my meals all planned out, but everything just fell short of my expectations. I don't think it has anything to do with the recipes, they were great, but I just didn't have that wonderful experience I expected when eating the meal. Of course, it's been a busy week for me, and my heart hasn't always been in my cooking this week. It's been one of those weeks where I made the same recipe that I have made a hundred times but this week it just didn't taste right. I know it's getting late in the month but when I ran across the Pajama Party Sew-Along at Sew Mama Sew I knew I just had to join in. You see I have been meaning to make pajamas for my two youngest children for quite some time, and just haven't gotten around to doing it. Quite sad, isn't it? You see what makes it so sad is that I already have all of the material and the patterns purchased. I won't go into details about how long ago I purchased it, but let's just say they were intended to be worn last winter, not this winter. The Wednesday night Bible Study group I have been attending is studying Loved By God by Liz Curtis Higgs. I must say that I have really been enjoying the class, and the videos that Liz does are hilarious. This past Wednesday night we were watching the video for week two, and I must say that Liz really hit a nerve with me. She was talking about a time when she was not walking with God, and it reminded me of my own story. I grew up in a Christian home, but strayed away from God when I entered my early twenties. I have since come back to God, but I am working on healing the wounds that were caused during that time and fixing the relationships that were destroyed during that time. 1. My car desperately needs to be cleaned. 2. David and Katelyn's birthday's are coming up next. 3. Lately, things seem to be moving too fast. 4. My bottom drawer is one of my favorite 'hiding' places. Except now my kids are figuring out that's where I hide everything. 5. What happened to summer, I can't believe it's almost fall. 6. Spaghetti sauce on the ceiling is not impossible! 7. And as for the weekend, tonight I'm looking forward to family game night, tomorrow my plans include catching up on my work and Sunday, I want to rest! Again, this recipe is designed for a family of six, so please be sure to adjust as necessary. 1. Cut chicken breasts into cubes, and put into the bottom of slow cooker. 2. Mix soy sauce, brown sugar, water, garlic and ginger in small bowl. Pour mixture over cubed chicken breasts. 3. 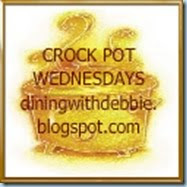 Cook in slow cooker on low for 4 - 5 hours, exact cooking time will depend on your slow cooker. 4. Serve over steamed white rice. Outside my window...the sun is shining, and the leaves are starting to turn colors. I am thinking...I wish the playroom was already reorganized. We just moved the playroom into a new room, and I have a mess waiting on me. I am thankful for...all of the blessings that I have been given in my life. From the learning rooms...we are on school break this week. From the kitchen...I am looking forward to trying some new recipes this week. I am wearing...a navy blue tee-shirt, blue jean shorts, and am still sporting my cast on my leg. I am creating...a more welcoming home environment for my family. I am going...be busy this week. Thursday is the only day we have to spend at home. I am reading...Mommywood by Tori Spelling. I have never been much of a Tori Spelling fan but after watching her show a few times I am intriqued by her. It's that time of the week again, time for Menu Plan Monday! Sunday - No cooking on Sundays. We eat lunch out after church on Sundays, and reheat leftovers for dinner. Buttermilk is not something that I keep on hand, but so many of my recipes call for the use of buttermilk. There are several easy substitutes that you can make for buttermilk with ingredients you more than likely have on hand. Add one tablespoon of lemon juice to one cup of milk. Stir and let sit for five minutes before using. Same as the lemon juice, add one tablespoon of vinegar to one cup of milk. Stir and let sit for five minutes before using. Add 1 3/4 teaspoons Cream of Tartar to one cup of milk. Use one cup of plain yogurt in place of every one cup of buttermilk called for. I try to avoid deep fried foods but I just can't help myself when it comes to hushpuppies. This is my favorite hushpuppy recipe, it's a recipe that I have created from tweaking other recipes here and there. I think the Seasoned Salt in it makes a huge difference in the taste, it gives it just the little kick that it needs. Now, I am not one to add corn to my hushpuppies, but I am sure that you could add corn into this recipe without any problems. 1. Preheat oil to 350 degrees for frying. I fry my hushpuppies in a deep fryer but you can use a deep skillet. 2. Mix all dry ingredients in a mixing bowl. Stir in onion. My husband grew up in a family of picky eaters, they did not try a lot of different dishes, and he has carried that frame of mind over into his adult life. This has proved to be a huge obstacle in cooking dinner. Recently he has begun to try new things but still likes his basic meat and potatoes. I have tried to adapt my cooking to his tastes, but let's be honest there are only so many ways you can cook potatoes. I try to make the majority of my food from scratch, so I don't buy a lot of the pre-packaged potatoes in the box, they are pretty much a no-no at our house. However I do make a cheesy potato dish based upon those pre-packaged potatoes. It's really easy to make, and is a big hit with my family. Just a note - all of my recipes are based upon a family of six, please be sure to adjust recipes according to the size of your family. If you need help scaling down a recipe please feel free to ask, I would love to help. That's a place where I want to be. Hello; I'm over here! The possibilities include: anything you want to be. Chicken and Dumplings is one of my favorite cool day recipes. How will you know where the sidewalk ends if you don't follow it. Summer nights and a stormy sky. And as for the weekend, tonight I'm looking forward to watching TV, tomorrow my plans include going to the Melonfest and Sunday, I want to REST! One of my goals this past week has been to implement meal planning. 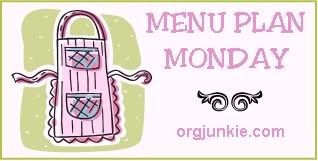 So with this comes my very first Menu Plan Monday post. I have a very simple way of baking tilapia. I line a cookie sheet with aluminum foil and lay the tilapia out on the foil. On top of each piece of tilapia I add a pat of butter, sprinkle it with Old Bay Seasoning, and then pour a little bit of lemon juice on it. Cover in aluminum foil, and bake in a 350 degree oven for 20 to 25 minutes or until fish is flaky. Serve over a bed of rice. I made these Luscious Lemon Bars for dessert tonight, and they are delicious! I usually end up tweaking all of the recipes that I use but this one needed no tweaking. The best part is that they are super easy to make! I ran across an interesting article today from Australia that compares the views of older feminists with younger women who are trying to recreate the idyllic 1950's housewife lifestyle. You can read the article here. While I do not agree with all of the views the younger women possess, especially the one about just accepting whatever amount of money her husband gives her to run the house, I do agree with many of their views and their wish to become more domestic instead of having it all.